This window is displayed when you double click on the book to edit or when you adding a new book. This window consists of several tabs with many fields. You do not need to fill them all by hand. Main buttons are highlighted as 1, 2 and 3. These buttons are for the automatic book details lookup. 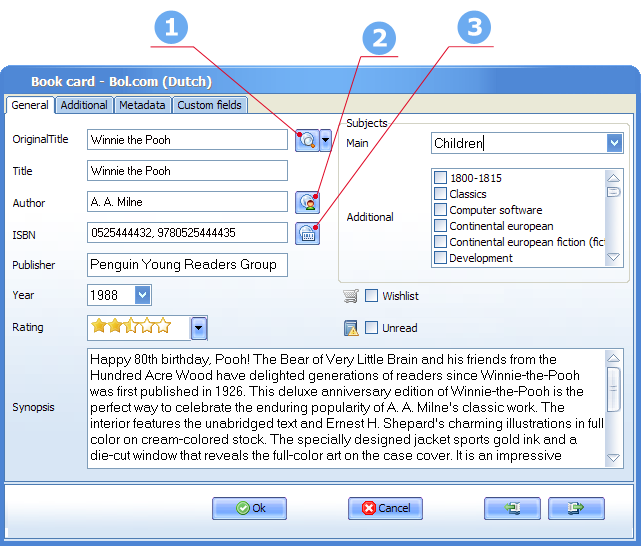 Currently selected online book database is displayed in the book card window's caption. You can switch online book databases to receive book details from by clicking on the small button ("arrow down") near 1. 1. Type the book's original title and click this button or press Enter key to start lookup the book's details in the selected online database. 2. Type the book's author name and click this button or press Enter key to start lookup the book's details in the selected online database. 3. Type the book's ISBN and click this button or press Enter key to start lookup the book's details in the selected online database.